An attractive map of Scotland by George Frederick Cruchley dated to 1850. It covers Scotland from the Orkney Islands to Wigton in the south, including the Hebrides or Western Isles. The Shetland and Orkney Islands are detailed in an inset in the lower left quadrant of the map. 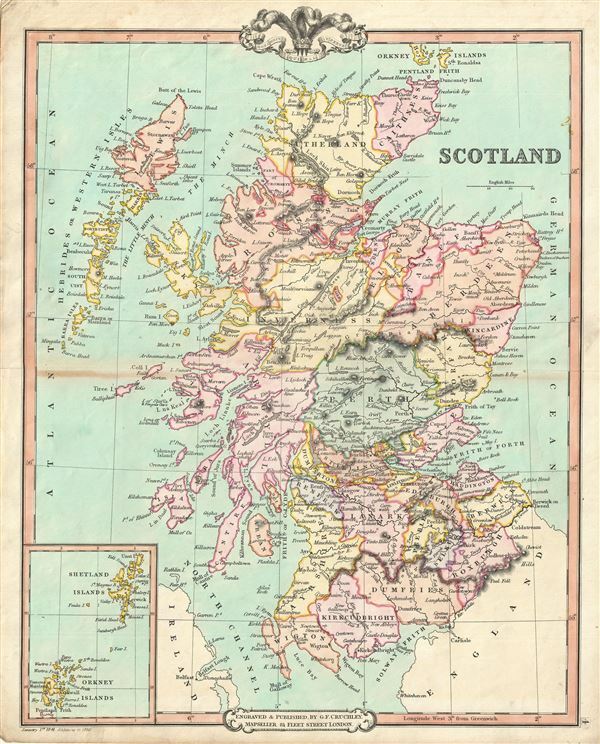 This map was issued in the midst of Scotland's Industrial Revolution, in which it emerged as a regional center for engineering and shipbuilding. In 1843, against the backdrop of the Industrial Revolution, during which Scotland flourished, the Church of Scotland witnessed a division in which many of its ministers, following a decade long conflict, broke away to form the Free Church of Scotland. Cruchles has color coded the map according to provinces and identifies important towns, cities, rivers, mountains and an assortment of other topographical features. Relief is shown by hachure.